There is no doubt that blazers are a wardrobe staple and a must have for every women. On an average every women owns at least one pair of stylish blazer. 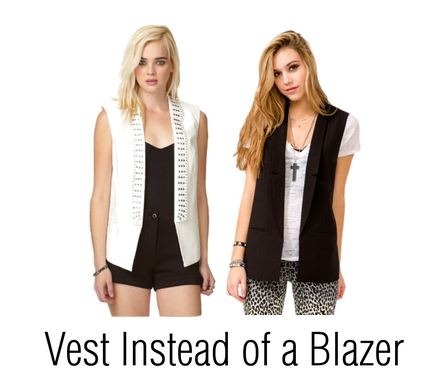 Taking the basic blazer fashion a knot higher, we are focusing on another wardrobe staple - Blazer Vest/ Sleeveless vest ... Very ‘90s and totally fresh at the moment. SBN is totally impressed with the fit and versatility of this item in any wardrobe. It's the perfect finishing touch to any ensemble, and is universally flattering. You can pair them with basic clothing you already own. It can be layered over a knit sweater for work or top off a tank and shorts to last throughout the summer. i love the blue gilet!! Lovely outfit! I am in love with the blazer. The color is gorgeous. Me encanta el maxi chaleco. Super cute color on your blazer vest. Thanks for the tips on how to wear them. I really like your flats too! In love with your frames and flats! Lovin your glasses dear!! You're always so sweet xoxo stay in touch! Great stylisation! this blazer looks amazing. Very nice! That's a great vest! I also love the glasses! look so great, love this gilet. I love your look Shalini, your vest is very cool!!!! great look and love your glasses! Love the jacket and the necklace! I love vests!!!! Fabulous wardrobe staple!!!! You did such a good job styling the vest! The color of the vest is beautiful. I am loving this trend too. You look gorgeous dear ! great outfit! Super cute look. Love the leather leggings. I love that blazer vest! You totally rock that vest! I think I still prefer a regular blazer, though, but you do look nice here. you are looking stunning. Love your blue jacket. Lovely outfit!! I want a vest like this! i love your styling...... and what nail paint are u wearing... such a yummm colour!!! love the cobalt blue jacket!! cute moustache pendant!! Amazingness!!! You look hot in that sunglasses. I don't realy like vests, but with this outfit you look fantastic. I have to try it.